Handwrite each note individually. It is important for your guest to know that you really were happy they were at your wedding and that you took the time to personally write them a note. Not sure what an appropriate thank-you should be written on? Have blank cards made that mimic the invite. The continuity will add a personal touch to the card itself. You can always ask your photographer about having blank cards made with your wedding photo on it. (check this out: A brilliant way to Thank your Wedding Guests) And, if that fails, there are many stationery options to satisfy the most eclectic of tastes. Plus, there are scores of DIY options and even seed paper (paper you can plant) for our greenest of brides. When writing your notes, always address the card with the recipients' names and make sure you also mention what the gift you received from them was. This makes the note all the more personal and it gives the recipient the confidence that you really did like their gift. For gifts received before the wedding, it is appropriate to send a note once the gift is received, even if the wedding has not taken place yet. Acknowledgment of the gift's arrival is very important in pre wedding etiquette. 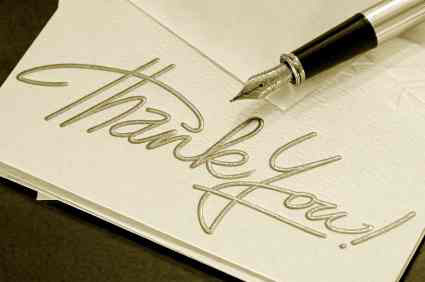 A thank-you card should not include a pre printed sentiment. It should always be handwritten and the message should be addressed accordingly. It is not appropriate to simply write "thank-you for your gift". Always mention what the gift was (see above in "do #2"). If you received money as a gift, you never mention the amount of money that was given. You would refer to the gift as generous and perhaps mention what it might be used for. Don't make the thank-you all about you. Keep it in the light that it is meant and discuss how thankful you are of the recipient's attendance at your wedding and how much you enjoyed their gift. Make sure you are prompt with writing and sending out your thank-you's. According to etiquette, the cards should be sent out no later than two weeks after you have returned from your honeymoon. There is no doubt in any one's mind that writing out several, even hundreds of thank-you cards is a huge task. However, your guests took time out of their schedule to select and buy a gift for you and to attend your wedding. It is only appropriate that you return the favour and take a moment out of your time to properly acknowledge each of them. Although it seems daunting, you will be so proud of yourself when you are done.